Diameter 40 cm | 15.7"
Height 50 cm | 19.7"
Suppose Design Office, an interior architecture studio, located in Hiroshima, Japan, once created a project that brought wilderness into an urbanistic environment. By distributing a huge number of cardboard pipes from the ceiling, they provided a feeling of walking through an exotic forest or an impressive cavern, recreating an incredible experience in any city downtown. Each piece, because is handmade, is unique enhancing the decór. 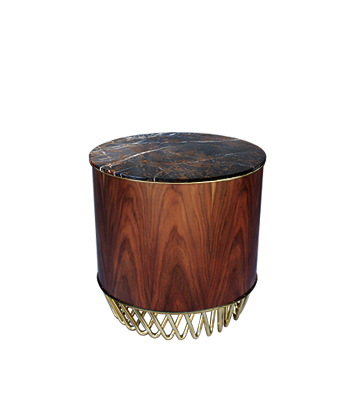 The Wanderlust Side Table, inspired by such project, features a variety of pipes in polished brass and walnut root that carry an artificial yet natural flair into any luxury interior space bringing a piece of art in your room. Table top finished in walnut wood root with high gloss varnish. 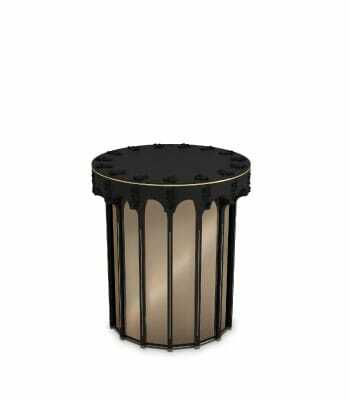 Base in gold plated brass. Dimensions Height 50 cm | 19.7"